Excelent chapter, Kona me lad, we'll make a fine writer out of you yet. Well, though I did enjoy this chapter, I can't help but wonder again if this tale has a reencarnation experience tied into it. But 'till next chapter *raises whiskey glass* cheers. Amnesia and I have a love-hate relationship going on. I love to hate it, and hate to love it. However, for the sake of teh Nanofatez, I will muscle through it. Also, you've already left me a good impression with your writing so it can't be that bad. My guess is the Liez twins... and clones... Clones of the Liez twins! Oh, they just broke past the gate. It was just an ordinary airlines in the outside after all. A/N: I’m sorry for leaving you guys a cliff-hanger but... it’s coming one way or the other... right? XD! Ah... so you’ve always felt the same way? “Everyone! Hide into the back room!” Lindy shouted as everyone scuttled inside the backroom of the main office with Fate slightly assisting Nanoha who seemed to have had her headache attack again. “Lindy-san, why are we hiding?” Fate asked as they whispered inside the backroom trying to breathe slowly, midly hugging Nanoha’s shoulders to keep her from falling. “We couldn’t let other troops or other people know what we can do. We should save our forces for last, so let the men handle the situation.” Lindy answered as they tried to listen to conversations outside. “Roger!” Every men in the main base answered as they all ran into full throttle to battle the seemingly unending horde of kabuki men. Kabuki men, who seem to be dressed as normal farmers from a faraway land, holding pikes, rakes and some wooden sticks and bamboos as weapon. They have no attack strategy and it seems like their only point into this attack is to bring chaos and panic. “Do not hurt them! They may be just normal civillians so capture them! We must question them inside the precinct later!” Chrono commanded as Verossa and his reinforcements appeared. “Do you guys mind telling me if this is the first time the base was attacked and why we can’t fight, except for keeping our abilities a secret?” Fate asked as she still carefull half-hugged Nanoha’s shoulder. “No, this is the third time. The first two were normal attacks of the official army. We are unonfficially listed as part of the Air Forces in Uminari but we are in Mid-Childa. We are only known as an Airline in here, so why almighty Military Personnel Regius Gaiz have attacked us twice, but immediately received house restraint from Mid-Childa.” Hayate basically answered with Carim picking up the answer for the next question. A slouched man wearing a kabuki mask who appears to be around his mid-fortys holding a burning torch let’s call Old Man was shouting at a young man let’s call Man A who has both his hands raised up in the air. “Now they’ve got false information about what we are doing! Those rascals—“ Miyuki said as she raged over at the window over hearing the whole conversation. “Na-Nanoha... you can’t do that.” Fate said as she hugged Nanoha tighter. 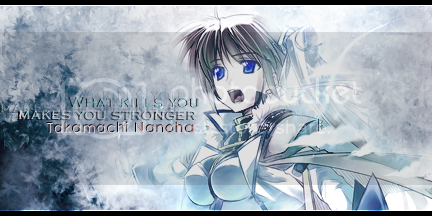 “Don’t worry Nanoha-chan. Let me.” Lindy said as she went outside through the back door and approached the Old Man from behind, with all the rest of the kabuki men being held into custody of the main base’s men force. “Good day Sir.” Lindy greeted as the old man turned around and look at her still waving his torch. The blue-green haired female smiled at the officer pursuing the old man to seize hostility, and the rest of the UIA officers as well. With the other kabuki men properly tied. “Now you even have a woman held captive in such a dirty base! Stop using dirty tactics! !” Old Man said as he practically wielded the torch as if his life depended on it in all directions. “Sir, do you know, Clyde Harlaown?” Lindy asked as she walked a step forward. “Why of course yes! He’s the member of the Military who sacrificed his life in order to stop an incident long ago! Why do you ask missy?” Old Man said as he regained a bit of posture and stood up with his head high. “Clyde Harlaown, is my husband. Do you think that the wife of a deceased but honorable Military member would rebel against the military? He might’ve died on field, but still he gave his life for something honorable and he was given credit for it. Do you think I would hate the military for that?” Lindy said as she walked closer and closer to the old man. “While were at this conversation, Hayate-chan please fix how you seat, I can see your flowered patterned underwear.” Carim stated as she coughed and headed over to her desk. “C’mon! It’s not like, you don’t see them everyday~” Hayate said as she teased the blue eyed blonde more. Ignoring Nanoha and Fate who are in their own worlds. “Nanoha... please rest.” Fate said as she tried to stop Nanoha from trying to type a few documents on her desk. Fate looked at Hayate and the others who just smiled at her. “Is she always like this?” the blonde asked sighing. “Yup, sorry ‘bout that. I hope you can help us change that.” Miyuki answered and clasped her hands together in-front of Fate as if pleading. “Nanoha...” Fate said as she softly grabbed the brunette’s arms and looked at those slate blue eyes. “Please, let’s go home. Now, okay?” She said softly but pleadingly beautiful. “O...O...Okay.” Nanoha answered as she looked down unable to return the blonde’s gaze, cheeks beet red. “Oh. Interesting.” Hayate, Miyuki and Carim said in interest as they saw what happened. No one had convinced the Takamachi Nanoha to take a half-day even if an incident of Kabuki Men attacked the base or she was adviced to take leave. No one can do that but, looks like someone here can do it now. “We-well... we’re both going home now. I’ll see you guys in three days.” Nanoha said and waved her hands on her chest, slightly having breathing difficulty attacks. “Mou, Nanoha-chan, it’s not like we’re not gonna visit you, we live in the same dorm!” Hayate said and waved back. “Nanoha… if you need anything, tell me okay? I want to help you.” Fate said as they both quickly reached their apartment rooms and went inside to chill. “Then soon enough… the media will then rush into the base… and ruin everything.” A female with slightly purple hair said as she drank red wine from her glass. “But Mistress Hevrolet, the kabuki plan had been dissolved.” A man around his early twenties said as he knelt in-front of the said female. “Ye-yes Ma’am! Proceeding into Plan Sankt Kaiser, Ma’am!” the man immediately stood up and saluted before speedily escaping the room. “You know, Nanoha. I really want to know about my past.” Fate said and walked behind Nanoha. “And I’m the one cooking today. Please rest on the couch for a while.” She continued and smiled as she held Nanoha’s hand that was holding the pot. “I really can’t escape huh? Well then, I will rest on the couch then.” Nanoha said as she held her breath slightly and blew a wind on Fate’s ear. “Make it delicious then, Fa~te~cha~n” And smiled her way to the couch. “Na-Na-Nanoha… I felt like my insides, and my mind were going to explode.” Fate thought to herself as she felt shivers and a tingling feeling surround her body. It was her hot breathe and seductive voice that made her shiver. “Well at least I hope that distracted her from my question for a while.” Nanoha said to herself and sat down the couch flipping on television channels. Nice chapter, so, Nanoha would like to confirm if Fate is her lost love from chilhood. Hm...So Vivio is in trouble again, and needs help. Don't worry Vivio! You're Mama's are coming! You didn't deny so it's true... lol. Yay an update! I wuv you. hm... the target is Nanoha.. I thought it will Fate.. hm interesting..
so nanoha is a target and plan B is vivio...but they've never met, right?? why is nanoha having so much headaches? is it from the poison still??? well, i'm definitely curious about fate's past!! update soon! and yes still from the poison. Large smoke of pink explosions are scattered in the air. Pile of rumbled flooring, cement and fences. The disturbed water rippled as a young girl with brown hair tied into twin ponytails flew above the sea holding a staff. The same young girl hurriedly flew towards another girl that appears to be of the same age. The brown haired female dove into the water and saved the other girl with blonde hair and red eyes. Laid her on a large rock and let her rest. The other girl remained unconscious lying on the ground as multiple helicopters flew around them and a few of magical guns pointed at the brown haired magical girl. “Put down your staff and put your hand high! Get away from her!” A staff from the said flying helicopters shouted down. As a few members of the ground forces SWAT slid down to same ground as the two young girls. But the brown haired female didn’t budge. She held the blonde haired female close to her body, fighting for her. Three members of the SWAT team grabbed the brown haired girl and forcefully tore her from the other magical girl. The conscious girl struggled to get back but to no avail, she’s got no fight for three muscle men. “This is an order from her Mother! Try one more into getting her back, and we will put up a case of kidnapping and act of violence against a kid like you!” She was thrown into the ground, as the men took the blonde female away. Putting her into a helicopter and flying away. A familiar blue-green haired female walked towards the brunette kneeling on the rock. The young girl lifted her head tears falling down from her eyes. “I wanted to be with her now...” Nanoha said as she opened her eyes with her arm covering her forehead blocking the ceiling lights from blinding her. She felt tears were about to fall from her eyes, together with seeing familiar blonde bangs above her. She then realized she fell asleep on the couch while Fate was cooking dinner. She immediately got up to hide her tears from the other female in the house and pretended to stretch. “Nanoha? Are you okay?” Fate asked as she reached out to the brunette, who dodged the comforting hand. This particular scene made Fate wonder, lost in thought as she prepared the dining table for their dinner. “Ah. Hayate! Do you have a minute? Can I talk to you?” Fate said as she practically blocked Hayate from going into someone’s room. “Well, I’m sort of busy, is this a love problem?” Hayate answered and smirked. “If it is, Hayate-chan and I would be more than welcome to accompany you.” Carim said as the door behind Fate opened. It was her room with Carim then. “We-We-well... n-not really. But, it’s about Nanoha.” Fate said while looking down the floor, blushing. “Oh-ho~ well then, come in! What are you hesitating for?” Hayate said as she pushed Fate into their apartment door and locked it. Just in time Nanoha was passing by the same hallway and saw the three of them enter the room, so she decided to check it out. “Locked door huh? Oh well.” Before she could leave, she heard Fate’s voice and words that made her heart race. “Well... yeah, what else would it be, if she can’t tell someone such as her roommate and closest person to her right now, about it... right?” Fate said as she stared at her hands. “I... I’ll try my best. Thank you Carim, Hayate.” Fate said and went outside of the room. “I didn’t even get to say a thing.” Hayate said and looked at Carim. “Fate-chan?” Nanoha said as she looked from the kitchen counter to the front door. “Ah, you’re back.” She said as she helped her remove her coat and go in the house. “What were you doing? Weren’t you supposed to be resting?” Fate asked and looked at the smaller female. “Well, I was bored so... I decided to just make some sandwiches. It’s on the table.” Nanoha said and went over to the couch and flopped down as Fate made her way to the sandwiches. “Umm... Nanoha...? If... If... y-you need someone to lean on... I’ll always be here for you.” She said and immediately turned her back. Missing Nanoha’s obvious blush. “Shamal! Stop drifting off!” Vita said as she popped her head out from the Commanding Room. “Make it fast, or else Signum would get swarmed by customers.” Vita said and went back into the command room. Shamal walked into the cargo room and found a blonde girl at one of the corners, crying. She rushed to her and slowly approached the girl. “I.... I’m looking for my Mama...” the young girl with heterochromatic eyes said, as if she was close to crying. A shackle tied to her ankle with a heavy looking box at the other end of it. “Do you know her name? Is she in this airplane?” Shamal ask as she tried to touch the young girl. “I-... I don’t know.” The young girl uttered that last sentence, before she completely collapsed on the ground, onto Shamal’s arms. It was a quiet evening whereas Nanoha spent the rest of the day avoiding Fate’s and trying to hide her affixed blush from since when the blonde female’s offer of depending on her. Before the red eyed female was about to climb on top of bunk bed, the smaller framed brunette called her name. This made the blonde stop dead on her tracks and look at the brown haired woman behind her, who suddenly pinned her by the steel stairs. She didn’t answer, she didn’t utter a thing. The brunette rested her head on the blonde’s shoulders, embracing her in a warm hug, before tugging her down to collapse on the bottom of the bunk bed. She trailed off, letting her hands slide down the thighs of the taller female, her hands roaming around as she pressed her weight on the female beneath her to prevent her from moving away. Fate got startled. Her mind isn’t following, of all that is happening currently, whatever she is hearing, whatever she is feeling, there’s one thing she knows, they don’t match up. “Nanoha? I’m not follow—“ before she could even protest, she felt soft lips cover hers gently. Before Fate could even protest a gentle finger was pressed on her lips, again, begging for her to please listen first. Nanoha was contemplating whether to tell Fate or not... but she's finally decided! What made her change her mind? Anyways, I loved the update Kona and I can't wait for the next one. You've raised so many questions (again) with this chapter that my mind is racing to try and figure them out. Not to mention, your work is very appreciated and I'm sure evaryone here agrees with me when I say that we will wait patiently for new updates from you to appear in the future. 'Till than, enjoy your writing as much as we enjoy reading your writing. P.S: Good luck with midterms.